Christmas shopping is an annual ritual for many Americans. It starts right after Thanksgiving. In my house shopping goes on all year long. My husband will search, surf and browse for anything with wheels — cars, motorcycles, trailers, RVs. Thankfully not fire trucks. 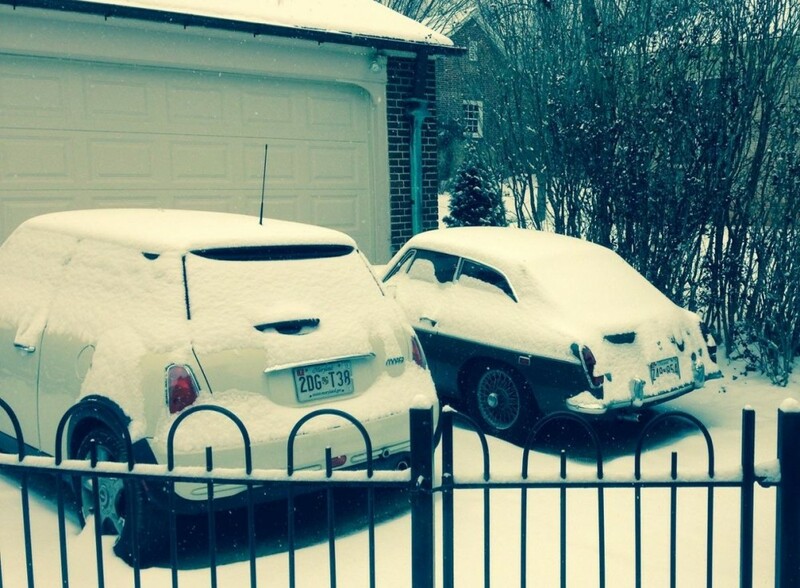 He recently sold his daily driver — a 1965 VW Bug — and needed to replace it. One night while shopping for wheeled vehicles at his computer, he lamented that all the best cars are on the West Coast. We live on the East Coast. It presented a logistical problem. He did. He bought a car in Portland, Oregon. And we went and got her. We drove her to Baltimore. Now the MGB GT is home where she belongs next to her sister. She’s never been driven in the rain and has been garaged at all times. Moss Motors picked up my Instagram shots in their Motoring Challenge gallery. I had estimated 4200 miles and 71 hours of driving. It came in at 4629 miles and 80 hours. Rolling through this big country took a bit more time than I expected. It was worth every minute. So after all that – did ya get your freakin’ T-shirt? !